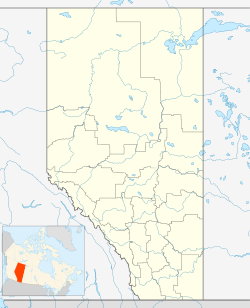 Ohaton is a hamlet in central Alberta, Canada within Camrose County. Previously an incorporated municipality, Ohaton dissolved from village status on January 1, 1946. Ohaton is located approximately 15 kilometres (9.3 mi) east of the City of Camrose. The Ohaton post office was opened in 1906 with the name "Ohaton" being a portmanteau of the partners Osler, Hammond and Nanton of a notable Winnipeg financial firm. Another town, Nanton, Alberta is also named for Augustus Meredith Nanton of the same firm. Ohaton and area's topography is rounded hills with a small river valley running through its southern portion. The surrounding area is mostly farmed with grain and canola or ranched with predominantly cattle. As a designated place in the 2016 Census of Population conducted by Statistics Canada, Ohaton recorded a population of 110 living in 50 of its 55 total private dwellings, a change of −8.3% from its 2011 population of 120. With a land area of 0.24 km2 (0.093 sq mi), it had a population density of 458.333458.3/km2 (1,187.0781,187.1/sq mi) in 2016. As a designated place in the 2011 Census, Ohaton had a population of 120 living in 46 of its 48 total dwellings, a -4% change from its 2006 population of 125. With a land area of 0.24 km2 (0.093 sq mi), it had a population density of 500.00500/km2 (1,295.01,290/sq mi) in 2011. The population of Ohaton according to Camrose County's 2008 municipal census is 135. ^ "The Alberta Gazette, 1946: Dissolution of the Village of Ohaton and the Lands Added to the Municipal District of Camrose No. 63". Government of Alberta. January 15, 1946. p. 39. Retrieved September 27, 2015. ^ a b c "Population and dwelling counts, for Canada, provinces and territories, and designated places, 2011 and 2006 censuses (Alberta)". Statistics Canada. 2012-02-08. Retrieved 2012-04-07. ^ "Specialized and Rural Municipalities and Their Communities" (PDF). Alberta Municipal Affairs. April 1, 2010. Retrieved June 6, 2010. ^ "Table 6a: Population by census divisions and subdivisions showing reorganization of rural areas, 1931-1946". Census of the Prairie Provinces, 1946. Volume I: Population. Ottawa: Dominion Bureau of Statistics. 1949. p. 422. ^ Karamitsanis, Aphrodite (1996). Place Names of Alberta: Central Alberta - Aphrodite Karamitsanis - Google Books. ISBN 9781895176445. Retrieved 2013-06-17 – via Google Books. ^ Karamitsanis, Aphrodite (1992-01-01). Place Names of Alberta: Southern Alberta - Aphrodite Karamitsanis - Google Books. ISBN 9780919813953. Retrieved 2013-06-17 – via Google Books. ^ "Population and dwelling counts, for Canada, provinces and territories, and designated places, 2016 and 2011 censuses – 100% data (Alberta)". Statistics Canada. February 8, 2017. Retrieved February 13, 2017. ^ Camrose County (2010-07-25). "Camrose County Census 2008" (PDF). Retrieved 2010-10-03. This page was last edited on 5 April 2018, at 03:58 (UTC).